A cheap and cheery MF TX from GW3UEP. 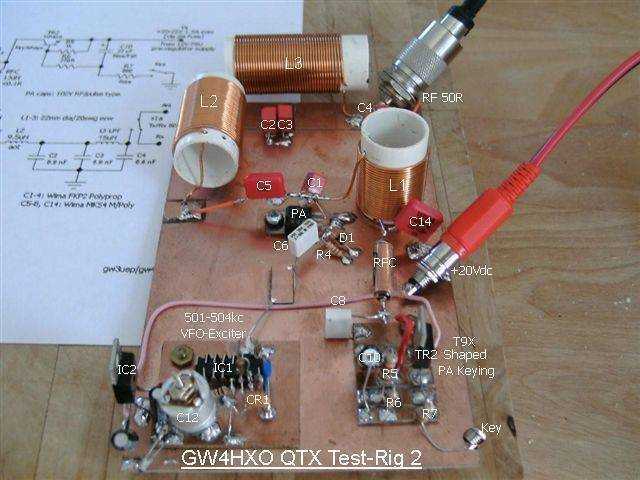 This is a development of Roger's simple 80m CW TX for use on 500kHz. The oscillator is based on an 8MHz ceramic resonator which can be "pulled" a few kHz giving a coverage of 501-504kHz after dividing by 16 in IC1. Here is GW4HXO's version undergoing tests. Note that the PA coils are all at right-angles to eachother to prevent mutual coupling.